Not here! Jesus has left the building. We do not know – we cannot see him! We do not know – we cannot hear him. We do not know – he is not with us. to be where Jesus is now? who are where Jesus is now? and put in our place. Henry Shelton and Jonathan Evens have published Mark of the Cross, a book of 20 poetic meditations on Christ’s journey to the cross and reactions to his resurrection and ascension. 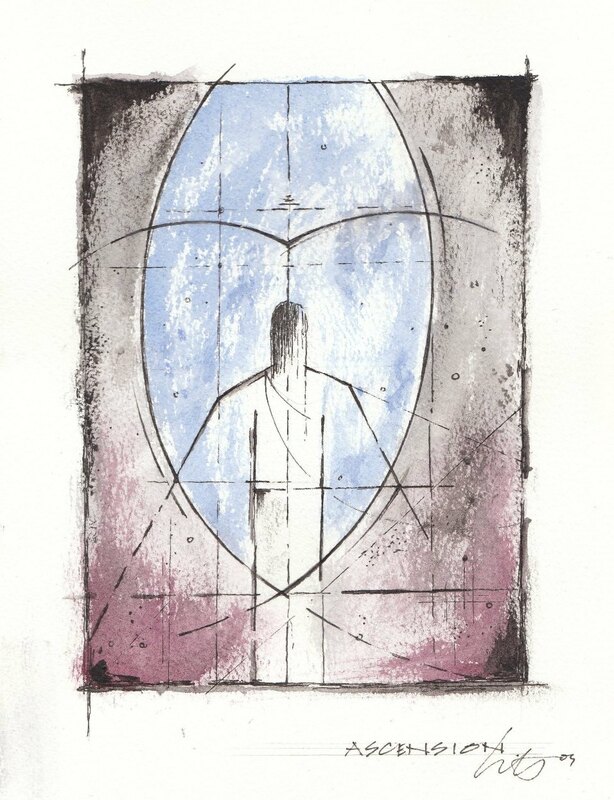 The meditations are complemented by a set of semi-abstract watercolours of the Stations of the Cross and the Resurrection created by Henry Shelton. These meditations and images are available via twelve baskets as a pdf book (http://www.theworshipcloud.com/view/store/mark-of-the-cross-pdf), a powerpoint presentation and as individual images. They are ideal for use within Lent, Passiontide, Holy Week and Easter services. Henry Shelton, Ascension, watercolour and ink on paper, 135mm x 180mm, 2010.